Reading Romans is foundational work for our lives as followers of Jesus. This letter has fascinated Christians for many centuries now, so there’s lots that’s been written about it. To save you from getting lost amongst everything that's been said about this letter, here's a few resources, and some recommended study guides, that will help you get more our of this great text. Writing in an approachable and anecdotal style, Tom Wright helps us see the great sweep of this letter. Romans has long been viewed as the book above all in which Paul puts forth the basic doctrines of the faith, and the picture of God's life for us. It is the classic setting-out of the Gospel. In this series, Tom Wright has undertaken a tremendous task: to provide guides to all the books of the New Testament and to include in them his own translation of the entire text. 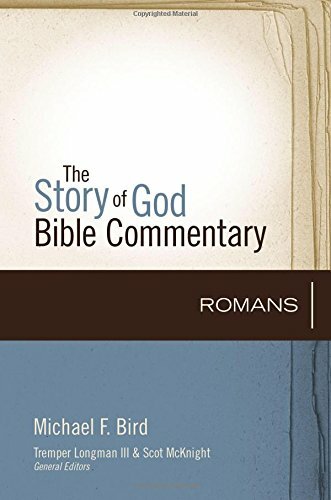 The Story of God Bible Commentary explains and illuminates each passage of Scripture in light of the Bible’s grand story. The first commentary series to do so, SGBC offers a clear and compelling exposition of biblical texts, guiding everyday readers in how to creatively and faithfully live out the Bible in their own contexts. Its story-centric approach is ideal for pastors, students, Sunday school teachers, and laypeople alike. In this inspiring collection of fifty-one sermons on Romans, Fleming Rutledge presents afresh the radical gospel of Paul. Countering the widespread suspicion that Paul somehow complicated Jesus' simple teachings, Rutledge shows how Paul actually makes explicit what is implicit in the Gospel narratives and reveals "the full dimensions of God's project to reclaim the cosmos and everything in it for himself." When reading the book of Romans, we often focus on the quotable passages, making brief stopovers and not staying long enough to grasp some of the big ideas it contains. Instead of raiding Paul's most famous letter for a passage here or a theme there, leading New Testament scholar Beverly Roberts Gaventa invites us to linger in Romans. She asks that we stay with the letter long enough to see how Romans reframes our tidy categories and dramatically enlarges our sense of the gospel. Containing profound insights written in accessible prose and illuminating references to contemporary culture, this engaging book explores the cosmic dimensions of the gospel that we read about in Paul's letter.